In the last few years, we’ve heard a lot about company culture: what it is, what it means, and why it’s important. Several of our country’s businesses have begun to build “culture first” organizations where culture drives the customer experience and profits, not the other way around. On the whole, focusing on your company culture improves employee engagement and results in a more productive team. When employees understand your company culture, they’re more connected to the mission, vision, and values of the organization and feel inspired to do great work. But understanding company culture is critical for management consultants, too. There are many reasons why we as management consultants need to thoroughly understand your company’s culture before we assist you with transforming your business. Below are just 3 reasons management consultants can help your organization more if they understand your company culture. Young consultant presents his ideas to colleagues during a meeting. 1. Addressing gaps between real and perceived company culture. 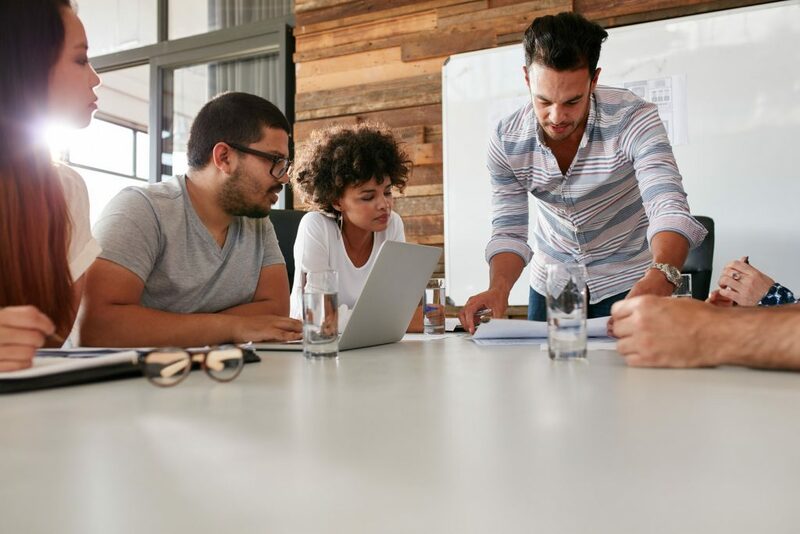 In many organizations, there is often a gap or divide between what C-suite perceives the company culture to be and how most employees experience the company culture. For example, C-suite may think the culture is “professional” but employees may feel that the organization is “stodgy” or “old-fashioned” and “conservative.” Gaps in real and perceived culture can even exist within the same team, especially if the team is diverse or has a high percentage of remote workers. If such a gap exists in how people perceive the company culture, then it may require more time to successfully gain buy-in and excitement for new changes within the business. Prior to even initiating such a project, our team would likely recommend working with the organization to solidify and clarify its company culture, and maybe even revisit the strategic plan to help address this gap. But without seeing and fully understanding the company’s existing culture and where potential gaps might be, we can’t even make this recommendation. When your business is undertaking a significant project, it’s important that the change be sustainable. Without thoroughly knowing and understanding a company’s culture, management consultants cannot navigate the change management process as successfully. For example, when it comes to reinforcing the change, consultants need to understand how to motivate employees to follow the new company process or standard. If the consultant team cannot understand what motivates your company’s employees, then reinforcing the change and making it “stick” will be much more challenging and time-consuming. Again, this piece feeds into your company’s culture. If your team knows, agrees with, and engages with your company’s mission, vision, and values, those will unite your team. As a business leader, you can remind the team how improving this process fits into the strategic plan and will bring you closer to the company vision. As management consultants, we can then do the same and help employees see how the organizational change aligns with their personal values and with the company values. 3. Finding informal leaders to support organizational change. Whenever your organization is majorly revising its strategic plan or undertaking a significant process improvement, it’s critical to find your company’s informal leaders and make sure that they support the change. In our experience, connecting with your organization’s positive leaders will bring you 30% of the way toward making the change successfully, and identifying any influencers who might oppose the change will bring you the rest of the way. However, without having a chance to observe the company culture and identify these informal leaders, management consultants will tread water during the change management process and, as a result of poor planning, the change effort will not be successful. Like a contractor requires nails, hammers, and screws to build a house, we need several tools as management consultants to make sure an organization’s change effort succeeds in the long-term. Culture is the lifeblood of a company. It connects and inspires employees, and it helps empower a team of diverse people strive toward the same goals. For this reason, it’s important that management consultants have the opportunity to understand a company’s existing office culture. With this knowledge, we can address gaps between the real and perceived company culture, foster sustainable change, and find informal leaders to support organizational change. And we can do so more efficiently and effectively. P.S. If you’re looking for help developing or refining your company culture, strategic planning can be a great start. We suggest that you review our strategic planning assessment to see if your strategic plan is up-to-date, or if it needs to be more robust. P.P.S. If you already know you want to bring on a management consultant, check out our list of the top 6 questions to ask before you make that hire. Or, if you’re interested in working with us, drop us a line.